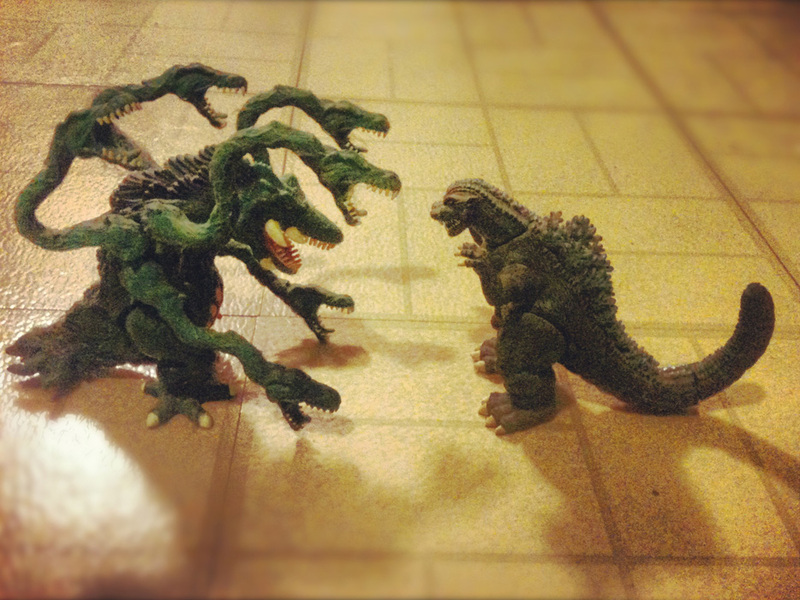 Godzilla Vs. Biollante finally out on DVD! For a long time I have been a fan of the Godzilla series of films produced by Toho. As someone who is into both science fiction and monsters, I really enjoy the idea of a dinosaur awoken from suspended animation by a nuclear explosion and mutated into a 200 foot tall behemoth with radioactive fire breath that goes around smashing cities to pieces. There have been a lot of Godzilla movies made since the creature’s debut in 1954, some excellent, some merely average, and a few truly dreadful. One of my favorites, which falls squarely into the first category, is Godzilla vs. Biolante. The film premiered in Japanese theaters in 1989, but due to various rights problems, took a number of years to make it onto home video here in the States. And it took even longer to finally come out on DVD, at last being released in late 2012. I have a confession to make: I actually bought a bootleg copy of Godzilla vs. Biolante at a science fiction convention in the early-1990s. That’s not something I usually do, but I had no idea if the film was going to get a proper release on VHS. It turned out that the videotape had a grainy picture and what seemed to be an especially poor dubbing job. Nevertheless, in spite of all that, I really enjoyed the movie. Godzilla vs. Biolante opens in the aftermath of the previous film, The Return of Godzilla (a.k.a. Godzilla 1985). Amidst the rubble of a demolished Tokyo, a team of mercenaries working for genetics corporation Bio-Major steals a sample of Godzilla’s cells left behind in the wake of his attack. The mercenaries, in turn, are ambushed by a hit-man in the employ of the Middle Eastern nation of Saradia. The cells are smuggled to that country, where the expatriate Dr. Shiragami (Koji Takahashi) hopes to use Godzilla’s DNA to create a crop of wheat that can flourish in the desert. However, Bio-Major launches a retaliatory strike, bombing Shiragami’s lab, killing his daughter Erika. Flash forwarding five years later, Godzilla is beginning to wake from his slumber at the bottom of the volcano he was lured into at the end of the last movie. The Japanese government, which possesses its own supply of Godzilla cells, approaches Shiragami to use them to develop Anti-Nuclear Energy Bacteria with which to attack the monster. Shiragami has secretly combined the cells of a rose with that of his dead daughter in an effort to preserve some semblance of her existence. The scientist now adds the Godzilla cells to this hybrid plant, hoping to imbue it with the monster’s restorative powers. 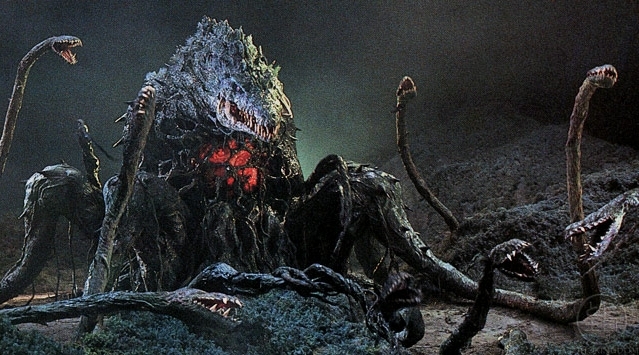 Instead, the rose develops into a towering plant creature which is dubbed Biollante. While both agents from Bio-Major and the hit-man from Saradia make plans to steal the Anti-Nuclear Energy Bacteria, the newly awakened Godzilla begins to make his way to Japan, sensing the presence of his genetic cousin. Also introduced in Godzilla vs. Biolante is the character of Miki Saegusa, a psychic teenager portrayed by actress Megumi Odaka. The character of Miki would prove to be very popular, and Odaka reprised the role in the next five films of the series. Godzilla vs. Biolante is an engaging story. The script was written by director Kazuki Ohmori, based upon a concept by Shinichiro Kobayashi. The direction by Ohmori is also excellent. He certainly does a superb job staging the final confrontation between Godzilla and Biollante. That must have been a lot of work, considering Biollante’s size, and her numerous vine tentacles thrashing about attacking Godzilla. That brings me to the whole “men in rubber suits” aspect of the Godzilla movies. Yes, seeing a guy in a monster costume smashing a scale model of a city may not appear one hundred percent realistic, especially with today’s CGI effects. But I really admire & respect the craft and hard work that the technicians at Toho have demonstrated over the decades, creating these intricate costumes and models, and then filming all of the action in real time. I also think there is often more of a weight (for lack of a better word) to those sorts of special effects than some of the stuff people put together on a computer. It can seem much more convincing to me as a viewer. As is pointed out in the “making of” feature on the DVD, both Godzilla and Biollante represent the dangers of unchecked scientific progress. Godzilla, of course, is the embodiment of the post-World War II dangers of nuclear destruction. Biollante, on the other hand, was inspired by the then relatively new fears of unsupervised genetic engineering, concerns that in the years since 1989 have certainly become more prevalent in the real world. One aspect that I have heard criticized about the movie is the soundtrack. Truthfully, in my opinion, for the most part the music by Koichi Sugiyama is pretty effective. It is a bit odd or melodramatic in places, compared to the more traditional themes used in many past entries of the series by composer Akira Ifukube. However, Sugiyama utilizes several of Ifukube’s compositions in certain places, making the soundtrack to the film a somewhat unusual, but nevertheless interesting, mix of new and old. As I mentioned before, that old bootleg VHS tape of Godzilla vs. Biolante was not the best quality. Watching the DVD of the movie yesterday, I was impressed at how much better the official release is. Of course the picture quality was better. What I was really pleased about was that the disk has the choice of being played with either an English dub, or with English subtitles over the original Japanese dialogue. I chose to watch it with the later, and the story was a lot clearer that way. Aside from the occasional typo or grammatical error, the subtitles appeared to have been put together with an eye towards accuracy. One more thing about that bootleg tape. Turns out that for some reason several key scenes from the movie had been cut out. Yeah, really stupid, huh? Watching the complete, unedited film on DVD, the story flowed a lot more smoothly, and a few areas where I had thought there were unexplained elements or plot holes vanished. By the way, back in the mid 1990s, the toy company Trendmasters produced a series of Godzilla action figures. When I was growing up, there had never really been any Godzilla-related toys available here in the States. As a kid, I’d always wanted to be able to have stuff like that. So, even though I was in college when the Trendmasters action figures came out, of course I had to buy a bunch of them. And, collectability be damned, I made sure to take them out of their packaging! After all, I wanted to put them on display. Among the assortment of monsters available in the toy line was Biollante. Given my fondness for the movie, of course I had to get that one. So, having re-watched Godzilla vs. Biolante on DVD, I then took those two action figures down from the bookshelf, dusted them off, and posed them facing off on the living room floor. Wish I had some kind of backdrop or something. I was considering using the rock from the turtle tank, but I didn’t think our red-eared slider Meeshee would have approved. Anyway, after a very long wait, it was great to be able to get this movie on DVD. I was thrilled when my girlfriend gave it to me as a present. If you happen to be a Godzilla fan, I highly recommend picking this one up. 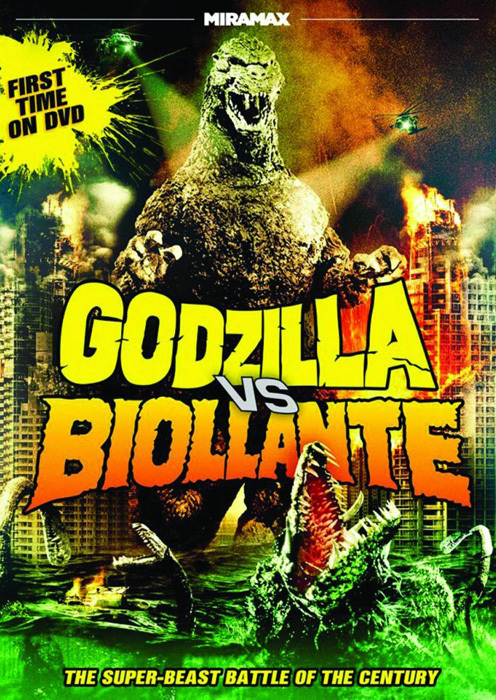 I wouldn’t mind finding a copy the movie ” Godzilla vs. Biolante ” myself .